It is harvest time in the countryside here. As you drive out of Chidambaram, workers are busy in the fields and off them. The sun is a tad sharp too after noontime though the dew drops strongly at night. The rivers through are mostly dry save for pools of water like ribbons. We drive past Sirkazhi temple - one space where the attempt to hold the Natyanjali fizzled out. If you leave the newly contracted highways and get into the by-roads the green is a soothing sight at this time of the year. 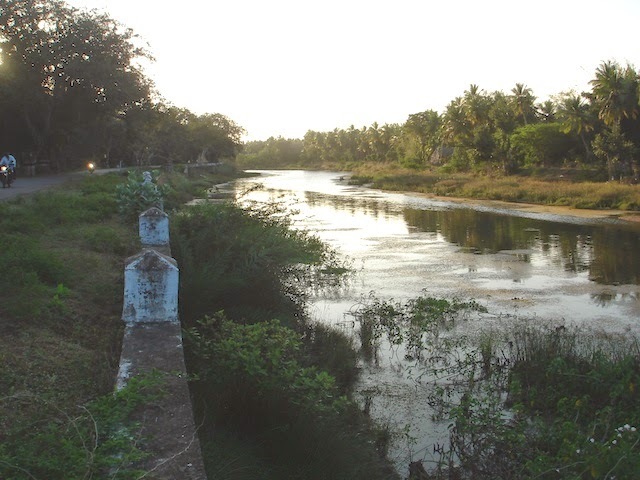 The photo here is of the Arasalyar river that runs into the Kumbakonam region.